The Superheroes of Kindness are very lucky in that we receive a lot of support and encouragement, from our first mission to our current one. This encouragement comes in many forms, and at times is local while other times more larger spread. One of the fun things I have been able to do is invite specific people who provide such encouragement on missions, watch them while the mission overflows their emotions, and then talk with them as they process the experience. I am always reminded the impact being with these petite sized superheroes has on the grown up community. The summer mission provides a great opportunity to provide a mission that our regular heroes can partake in, but others with a heart embracing the Superheroes of Kindness can also join and it was very exciting to see so many people embrace this opportunity. That day we were joined by a few children, parents, a grandma, a couple teachers and a couple friends. Luckily, one of the attendees had recently made a lot of tissue paper flowers for a wedding and was well practiced and skilled! The flowers started popping up everywhere. The children, who had been away from school on summer and who were excited to see familiar friends and toys, quickly got distracted, but the adults pulled through not only growing flowers, but using their magnetic personalities to pull over a couple children to help. As we gathered our first wagon full, a brother and sister started making groups of ten, looking to make ten groups to put in a bag. Man, I cannot tell you how thankful I am not only for these dedicated flower makers, but for their positive personalities! Well, after two hours of hard work, everyone went home to dinner and awaited the big day (which was one and a half weeks away! At first some didn’t speak up to loud and just kind of followed the runners holding up a homemade flower. Needless to say, the runners didn’t quite see that. As they learned to speak up they became a little more of a force to be reckoned with. At points, it seemed like they made a barrier, and as runners tried to go around, they shifted until a flower was taken. They were not going to take no thank you for an answer! One child ran up to me every time he handed out a flower to tell me he gave another person one and then would run back to hand out another. He was so excited! Another child ended up right at the timing line a couple of times wanting to not miss a person. And can you imagine their surprise when Santa crossed the finish line! Wow. Santa told the Superheroes they were definitely on the good list. Several runners came up to tell me how much they appreciated the flower. It was a surprise to the runners, of course, and after they figured out why a child in a cape was chasing them down, many couldn’t help but smile. A couple people took pictures with the children, some on their own with their flower, and some, well, some graciously accepted the flower that a child was so excited to give them and gave it back to be reused for someone else. One thing I didn’t expect was how fun it would be to do a mission for people who don’t necessarily know us. In town people often have heard of us, or, when we call to set up a mission ask about us. But here, there were people from all over the country, well other countries too, and they did not realize they may run into kids in capes handing them flowers on a Saturday morning just because. One person asked, “What are you?” (the ‘you’ gesturing to us all). Asked friendly, though. (And hey, I am a grown women wearing a cape with a bunch of children wearing capes, it had to be asked at some point!) I had to laugh. 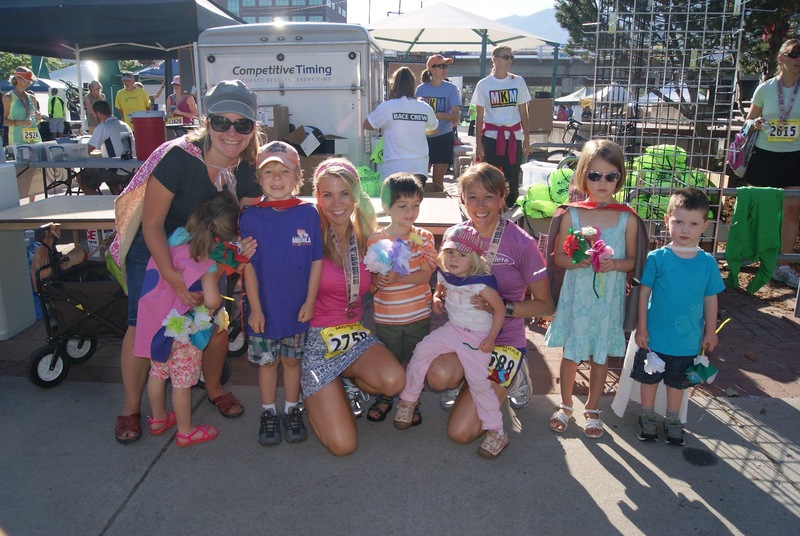 I hope the runners and organizers had as much fun as we did! With luck, we will be back next year.